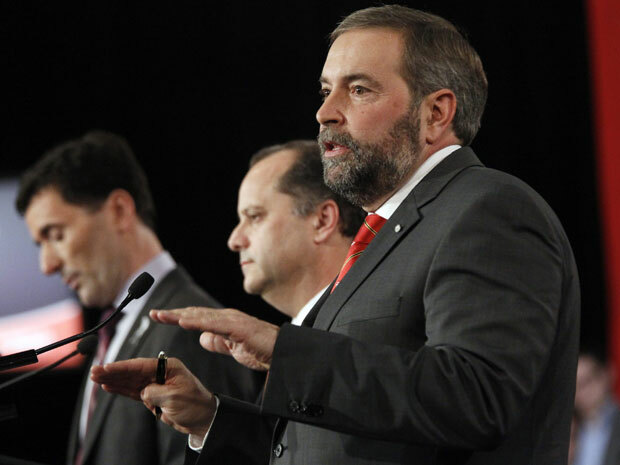 The first NDP leadership debate was this afternoon, and it would appear from the coverage that the only victor was expediency and those who speak in sound bites. Nine candidate took the stage (Brian Topp, Thomas Mulcair, Paul Dewar, Nathan Cullen, Toronto MP Peggy Nash, Quebec MP Roméo Saganash, Nova Scotia MP Robert Chisholm, Manitoba MP Niki Ashton and Nova Scotia pharmacist Martin Singh), and in the two hour debate on the economy and the environment everyone appeared to keep it polite, rather than begin the race to succeed Jack Layton turn into a political civil war. What better way to honour Jack’s legacy, right? I am proud of the NDP for grouping the economy and the environment together in one debate, as the two are often seen to be in deep contention. It demonstrates that the current conservative way of thinking that one can only come at the expense of the other is not the only framework for thinking about these issues – and in the process, showcasing how outdated and narrow a way it is of looking at both issues. Toronto MP Peggy Nash spoke about Canada’s need to process raw materials within the country to help spur the growth of new processing industries. This would also play an import role, she felt, in greening the Canadian economy. NDP leadership candidate Nathan Cullen said as much to me in an interview I conducted with him at Hart House in Toronto, back in October. He told me of a business trip he had made to Texas to speak with someone in the oil industry, and the conversation turned to Canada’s sending oil sands oil to Texas for refining. The oilman remarked, as Cullen told me, that Canada was foolish in sending our raw materials south for processing when jobs, industry, and dollars could be kept in Canada. In other words, if you are going to extract tar sands oil from the Earth, you may as well keep the profits from such an endeavour at home. Meanwhile, while one poll has suggested that the focus on the leadership debate has hurt the NDP in recent weeks, the New Democrats are noting that membership in the party has risen 13 percent in the fall alone. The Dippers can now number themselves at 90,006 card-carrying members as of November 16, according to the Vancouver Sun. But in the debate, expediency was the name of the game, as with only two hours to spend on two issues of strategic importance to the country and nine candidates to hear, a fifteen-second rapid fire question period was deemed necessary. It also drew the most ire from commentators and pundits alike. Another early concern from those who took in the proceedings was the importance of speaking French in determining the next NDP leader. The common complaint was that an inability to speak French should not deter the best candidate from seeking (or obtaining) the leadership of the party, although with the strong NDP presence in Quebec following the previous election, it would be folly to elect a leader (in Toronto, no less) who cannot effectively speak the French language. Some candidates who struggle with French (such as Nova Scotia MP Robert Chisholm) had to rely on simultaneous translation and reply in English. The short time often allocated to speakers ensured that platitudes and sound bites were out in abundance, with little of substance to display. But in the rapid-fire segment how could you not? As difficult as it would be to be concise while remaining lucid and intelligent in fifteen seconds, the rapid fire section does have its charm. And importance. In the scrum, leaders are expected to be quick thinking, stay true to the party line, and speak in terms the media can easily pick up and relate to readers and viewers across the country. Practicing this on live television in front of your competition (who also happen to be your peers) would be tremendous practice. Think back to the way in which Michael Ignatieff was lambasted not only for his inability to connect with viewers during the debates, but his inability to speak in effective sound bites. Lament the state of political discourse if you will (and I’m not saying I don’t), but this is the harsh reality. So good on the NDP for incorporating an important aspect of the political animal into the debates. Candidates may not like it, but it’s a part of the job. A lack of a detail and substance characterized the first debate the potential leaders will hold. Likely as the debates continue, the mounting costs of running a leadership bid and the pressures of creating workable and detailed policy options will see the number of candidates whittled down to a more manageable size. The increasingly harsh critiques by their peers will also wear down the nerve to continue, as well it should – they are running to lead the Official Opposition of the nation, and ultimately square off against Stephen Harper (and the next Liberal leader) for control of the country! This is not for the faint of heart. Moving forward, being civil is all well and good, and it’s a welcome change from what we see happening in the GOP race in America. But the leadership will go to whomever can differentiate themselves from their opponents in the most effective and direct way possible, proving to have chops not only in the French language, but in workable policy, strategic vision, fundraising prowess, and strong leadership. And hopefully accomplish this without having to decimate their colleagues and peers in the process.